Snowshoe by the light of the moon! Discover the Cascades under the bright moonlight reflecting off of the white snow, and look for signs of animals in their nocturnal wonderland! Wanderlust Tours runs monthly moonlight snowshoe trips for the few nights surrounding each full moon from November to April. 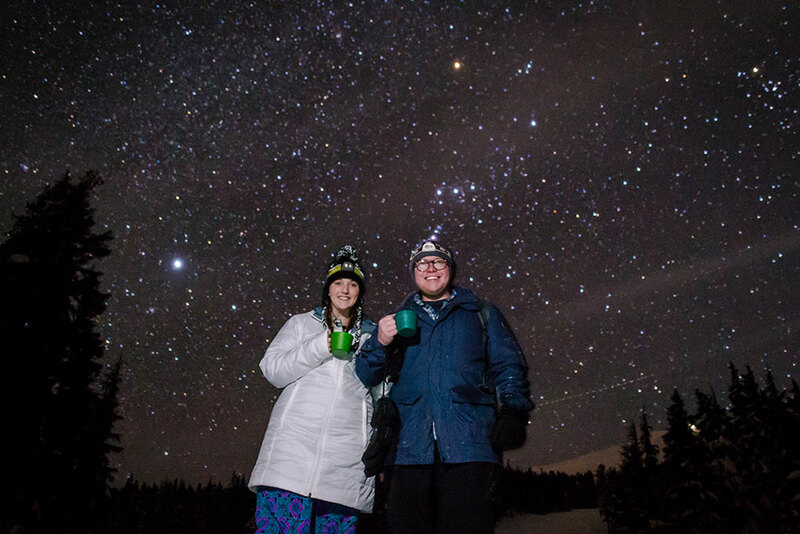 Each other night throughout the winter we offer starlight snowshoe tours! Exploring with Wanderlust Tours' renowned naturalist snowshoe guides, tour participants will get away from the light of the city, learn about the constellations, watch for shooting stars, and listen for the hush of the nighttime forest of the Cascades. Enjoy hot chocolate with marshmallows at the end of your moonlight or starlight tour. Snowshoes are included on all tours! Wear winter *boots and powder/ski pants to keep your feet and legs dry. Don’t see the date you’re looking for? Please call our office at (541) 389-8359 to check availability. Included: Guide, Headlamps, Snowshoes, Hot Cocoa, Transportation and Award-winning Naturalist Interpretation! Unfortunately, we cannot allow dogs on our tours. Please reach out to Ponderosa Paws for your dog-sitting needs. Waterproof boots, pants, and jackets are available for rent through Wanderlust Tours. Please reserve sizes when you make your reservation. Starlight Snowshoe Tours available ALL other evenings!